Members of the Philadelphia Eagles celebrate during a ceremony honoring their Super Bowl win on Feb. 8, 2018, in Philadelphia. The Philadelphia Eagles are still celebrating their Super Bowl win, but they won’t be doing it at the White House. Fewer than 10 of the players planned to attend the White House visit, so the offer was taken back. Supposedly, they were disinvited because the team doesn’t agree with standing during the national anthem. President Donald Trump issued a statement Monday saying that the full team wouldn’t be attending the event, so they were being disinvited because they disagree with their president. 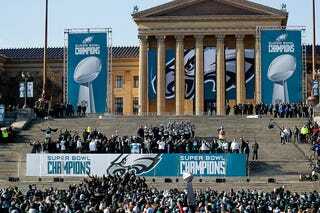 Well, Philadelphia Mayor Jim Kenney has the Eagles’ back because he released a statement saying that Trump is only obsessed with crowd size and is afraid of embarrassment, the Washington Times reports. “Disinviting them from the White House only proves that our President is not a true patriot, but a fragile egomaniac obsessed with crowd size and afraid of the embarrassment of throwing a party to which no one wants to attend,” Kenney said. At the end of the day, Trump remains embarrassed because no one important wants to visit him, so he takes to Twitter to release his anger.